When I bought Naomi’s Room by Jonathan Aycliffe, I had some vague idea that it was a dark, creepy but ultimately realistic psychological thriller about a man trying to unravel the mystery of his missing child, not least because the cover describes it as 'the psychological masterpiece'. Turns out I was wrong, though. 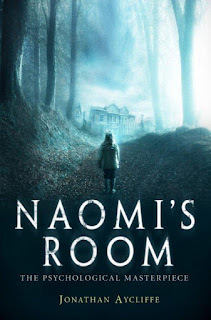 Naomi’s Room is a full-on terrifying horror story, complete with ghosts and gruesomeness. Charles Hillenbrand, an ageing academic living alone in a large Cambridge house, is tortured not only by the loss of his five-year-old daughter Naomi twenty or so years previously but also by the relentless haunting of his home. As the novel proceeds, we begin to learn what happened to Naomi and why Hillenbrand still lives alone, dogged by the oppressive, malevolent ghosts who torment him daily. From the moment Hillenbrand begins to talk of strange noises and odd happenings in Naomi’s old nursery, I was pleasingly unsettled: the ghost story elements of this novel are extremely well-executed and for me, among the most frightening I've read. Most of the novel relates what happened at the time of Naomi's disappearance, and does so very effectively, but for me it's the present-day narrative, the story of Hillenbrand living by himself and unable to find peace, that really does have the fearfully oppressive, claustrophobic feel of the most terrifying ghost stories (another excellent example of this is Michelle Paver's Dark Matter, probably the most frightening book I've ever read) - although there are certainly elements to the 1970s chapters - most notably the intervention of a photographer whose pictures prove chillingly revealing - that also made me shiver. Where I found Naomi's Room a little less successful were the points at which things escalated into gore and violence. There are times when Aycliffe leaves particular things unsaid, planting terrifying images in the reader's mind through hints and allusions, and this is highly effective (not to mention skilled). But there also one or two sections in the book that are explicitly gruesome and edging into sadistic territory. There is perhaps a degree to which these were necessary, as - without giving too much away - a certain shock value is required at certain moments in the story, but I found myself wondering if some of the horror might have been more skin-crawlingly eerie and less Grand Guignol if Aycliffe had just reined it in a little. I also felt that some of the characters were rather under-explored, which in some ways made their fates seem more gratuitous. I'd like to have seen them developed into more than victims. I have just started reading this and it's definitely not a bedtime read. I'm just under half way through and it's getting a bit sinister now. It's a departure from my usual escapism reads but it's intriguing ... I don't want to read on but I do. You should really try some of his other books, The Matrix and The Talisman being two particular favourites of mine. It's a shame that Mr. McEoin has stopped writing altogether - I always felt he was the heir of the MR James crown. To correct Mr Sheephouse, I have not stopped writing. A new Aycliffe, The Silence of Ghosts, will appear in October 2013, and another is being written on this same computer now. I hope you all enjoy them. I'm delighted to hear you have a new book due out this year and I'll certainly be reading it. Looking forward to it already. My apologies to Denis. Great news, I can't wait!